A team of researchers has created the world’s fastest thin-film organic transistor, operating at more than five times faster than previous examples. In the January 8 edition of Nature Communications, engineers from the University of Nebraska-Lincoln (UNL) and Stanford University show how they created thin-film organic transistors that could operate more than five times faster than previous examples of this experimental technology. Some of the work was performed by SLAC National Accelerator Laboratory researchers at the lab’s Stanford Synchrotron Radiation Lightsource (SSRL). The research teams were led by Zhenan Bao, professor of chemical engineering at Stanford and member of the Stanford Institute for Materials and Energy Sciences, which is run jointly with SLAC; and Jinsong Huang, assistant professor of mechanical and materials engineering at UNL. 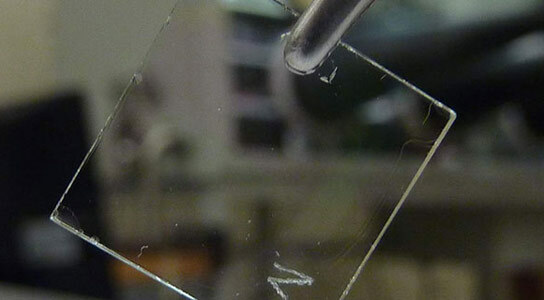 They used their new process to make organic thin-film transistors with electronic characteristics comparable to those found in expensive, curved-screen television displays based on a form of silicon technology. Other key members of the research teams included Yongbo Yuan, a postdoctoral associate at UNL’s Nebraska Center for Materials and Nanoscience, Gaurav Giri, a graduate student in chemical engineering at Stanford and Alex Ayzner, a postdoctoral researcher at SSRL. SSRL’s Stefan Mannsfeld, Dennis Nordlund and Michael Toney also contributed to the research. This article originally appeared on the Stanford School of Engineering website. Tom Abate is a science writer and Associate Director of Communications at Stanford Engineering. Carole Wilbeck of the UNL College of Engineering also contributed to this report. Be the first to comment on "Researchers Create World’s Fastest Organic Transistor"